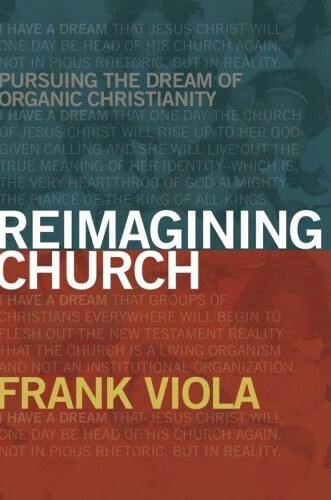 Reimagining Church is Frank Viola’s reconstructive sequel to the challenging, deconstructive critique of modern church practices, Pagan Christianity (co-authored with George Barna). The basic synopsis of the book is built around the arguments presented in Pagan Christianity. Theoretically, the two books should be read together, but frankly, if you missed the prequel, you can still jump into the sequel and not get lost. As a marketer for a para-church organization, there were some interesting points to glean. Of course, this isn’t a book on marketing, but it does call into question whether or not our definition of “the church” is accurate. So, I wondered to myself, as I read it, if I had unnecessarily been investing time into marketing an institution that really wasn’t supposed to be an institution. Viola explores biblical ecclesiology from a narrative-based perspective of Scripture, admitting his own limitations and influences. He challenges the reader to imagine a church that only follows the New Testament model for fellowship and community and to dispose of practices that don’t comply with the examples given by the apostles and early Christians. The church, he argues rather simply, is primarily an organism, not an organization. Reimagining Church is broken up into different chapters, each dealing with a unique aspect of church that must be reimagined. Topics vary from leadership and submission to authority to the proper place of teachers and the validity of pastors’ salaries. In the beginning of the book, Viola concentrates on practical experiences that serve as examples of his propositions. In the latter parts, he seems to do this less often, which was admittedly disappointing. But he still provides convincing, albeit theoretical, proofs for why most evangelical churches should probably be re-imagined and reconstructed around a more solid basis of Scripture. Not only must we return to the Bible and re-imagine church, the author argues, but we must also re-imagine how we read the Bible. Viola explains that the way in which Paul’s epistles are ordered in the New Testament is misleading. Instead of telling a story, they are arranged in classical Greek manner (longest documents first, followed by shorter ones). If we understood the story that God is trying to communicate to us, we would realize what it looks like to be the ekklesia, that is, the true bride of Christ. As you can guess, this isn’t the sort of book that is going to get a lot of praise from the pulpit. However, as I read it, I sensed that there were elements of biblical truth in it and was convicted to share some concerns with my pastor. We met a few times to discuss the issues, and he raised some interesting questions himself, which I sent directly to Mr. Viola for his feedback. Viola does answer questions at the end of each chapter, but I wanted something a little more personal, so I e-mailed him. I was wondering whether or not some of our messed-up, unbiblical, modern church traditions could, in fact, be redeemed for the sake of pragmatism and not causing further schism in the church. I asked Frank why he wasn’t seeking to restore the broken church; why re-imagine it entirely? That seemed a bit radical, I told him. He said that people have been trying that for the past 50 years with little success, and he keeps encountering church leaders who believe that they have wasted much of their time in trying to change a man-made system instead of just being obedient to Scripture. And that, ultimately, seems to sum up Viola’s intention in writing Reimagining Church. He wants to get more Christians to call into question why they “do church” a certain way and be driven back to the Scriptures to find the answers to questions that they didn’t even know they had. Maybe in order to get there, though, they’ll have to do a little re-imagining themselves. Regardless of whether or not one buys Viola’s argument, it’s hard to argue against the strength of organic entities. Most marketers (even churches) are going back to the drawing board these days, looking at how they can creatively spend their resources to promote their product in new and creative ways that are often less-institutional, less-expensive, and far more effective. Look at Napster, Wikipedia and the Internet (thank you, Al Gore). The most influential movements of the past 50 years have been more organic than institutional. Viola’s Reimagining Church asks the implicit question: Why not the church, too? Jeff Goins is the communications director for Adventures in Missions and is also a blogger, author and speaker. You can find him online at his blog, follow him on Twitter and check out his new book, Wrecked. Read more posts by Jeff Goins | Want to write for us? My humble suggestion is that people interested in re-imagining the Church should Google the book “Becoming Orthodox” which describes the journey of a dedicated group of Evangelicals who found the Church they were seeking in Orthodoxy. The Church as a Dream Factory or a Do Factory?